Research evidence indicates that formative assessment is one of the most effective ways of enhancing student learning. It is, however, difficult to implement successfully, principally because what is tested through summative assessment has such a powerful influence on teacher and student actions. This book scrutinizes the relationship between testing and learning from alternative perspectives to the dominant literature from the major Anglophone countries. 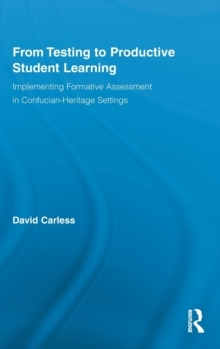 It develops the notion of contextually grounded formative assessment practices by analyzing data from schools in the Confucian-heritage setting of Hong Kong. It explores questions such as:* Under what circumstances do tests support or hinder student learning? * How can teachers effectively prepare students for tests and appropriately follow up after tests? * What are the key socio-cultural influences impacting on testing and student learning in the classroom? * How do teachers change in their orientation towards assessment and what support do they require?This text is a valuable resource for education students, professionals and researchers, policy-makers and curriculum developers.